HAVING a baby's the best time of your life, right? With one in six mothers suffering postnatal depression, it's not always the case. The shame many women experience while struck by the baby blues keeps them from seeking help, which is why a Sunshine Coast psychology clinic is this month celebrating helping more than 500 mums. The Sunshine Coast Postnatal Depression Centre recently celebrated 10 years of helping women survive postnatal depression with a reunion of clients at its Maroochydore clinic. Mother-of-two Aimee Browne is among the "alumni” and says the mix of group sessions with other mums and individual sessions with a trained psychologist at the practice helped her enormously. She said she experienced symptoms of depression after the traumatic birth of her first child and trouble with breastfeeding, but didn't recognise them until nearly a year later. "I was too embarrassed about what I was feeling and felt like I should be coping. I was grumpy all the time and didn't tell anyone,” she said. After the birth of her second child, who would wake 20 times a night, Ms Browne said sleep deprivation contributed to her experiencing more severe symptoms. Post Natal Depression. 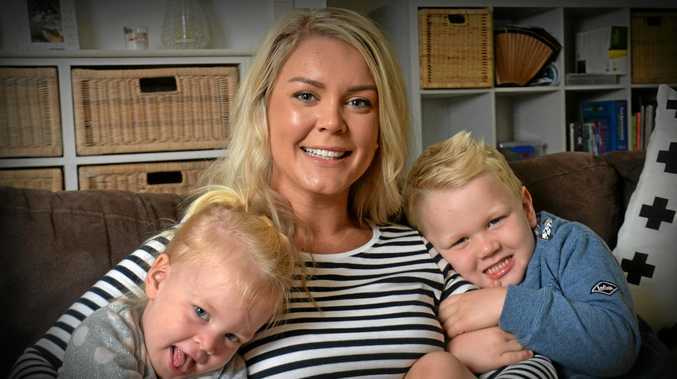 : Aimee Browne overcame post natal depression with the help of a Maroochydore clinic that's now turning 10. The second time around she recognised that what she was feeling wasn't healthy and, with some persuasion from her sister and a friend, found help. "It took me a lot of courage to get out of my car and walk in,” she said. She said despite intense anxiety and having broken out with a nervous rash on her chest, she finally went in. The group of mothers instantly put her at ease. "Straight away I was greeted by friendly faces - the facilitators and all the other women,” she said. She had assumed people with depression "looked a certain way” but after going to the group sessions she found they were all "normal people” - busy, hard-working and many of them professionals before they became full-time mums. Psychologist Lindsay Cote said warning signs for mums to look out for include feeling low in mood for more than two weeks, and feeling as though you're "not coping or not measuring up”. Feeling anxious a lot, feeling isolated, crying a lot and thinking about suicide are also signs to reach out, she said. The Sunshine Coast Psychology Clinic, where the PND Centre is based, uses cognitive behaviour therapy as its primary tool for helping women overcome the illness. "If you can change a person's beliefs and behaviour you can change the way they feel,” Ms Cote said. She said women suffering the condition often benefited from practical support and problem solving. "I've seen women in the past who have a really hard time asking for help because there's a belief they should be able to do it on their own,” she said. Resources for mums and partners are also available at Beyondblue - click here.